An estimated 20 million Americans have gained health insurance as a result of the Affordable Care Act (ACA), President Barack Obama announced in March. But coverage options are not consistent across the country, with some regions offering a menu of choices and others only one. This trend will be exacerbated as major insurance companies back out of markets, according to a new analysis by Avalere Health, a Washington-based consulting firm. Aetna, Humana, and UnitedHealth Group announced this summer that they will significantly decrease the number of areas where they will sell individual health plans in 2017, citing financial losses on those plans. Aetna announced on Aug. 15 that in 2017 it will reduce its individual public exchange participation from 778 to 242 counties. The provider reported pretax losses of more than $430 million since January 2014 on individual products. It will only maintain an on-exchange presence in Delaware, Iowa, Nebraska, and Virginia. With the departure of Aetna, Arizona’s Pinal County—a region next to Phoenix with a population of about 400,000—may become the first county in the nation to have a public exchange but no health plans to choose from in 2017. It’s conceivable more may follow. “More than 40 payers of various sizes have similarly chosen to stop selling plans … collectively exiting hundreds of rating areas in more than 30 states,” said Aetna in its statement. “As a strong supporter of public exchanges as a means to meet the needs of the uninsured, we regret having to make this decision,” the company said. Aetna has been trying to merge with Humana, but the U.S. Department of Justice filed a lawsuit last month to block the move. Currently, Blue Cross Blue Shield of Arizona is participating in the state, but it also announced plans to move out by 2017. Regulators must now look for another insurance provider to fill in the gap before the next enrollment season begins. While Pinal may be the first rating region to have no insurers at all, other areas will also see their options shrink. Rating regions are the geographic areas used to set insurance premiums. Individuals are only allowed to buy plans offered within their rating region. Almost 36 percent of exchange market rating regions may be left with only one participating insurance carrier for 2017, up from 4 percent in 2016, according to Avalere Health. Other sub-region counties might end up with zero plans. 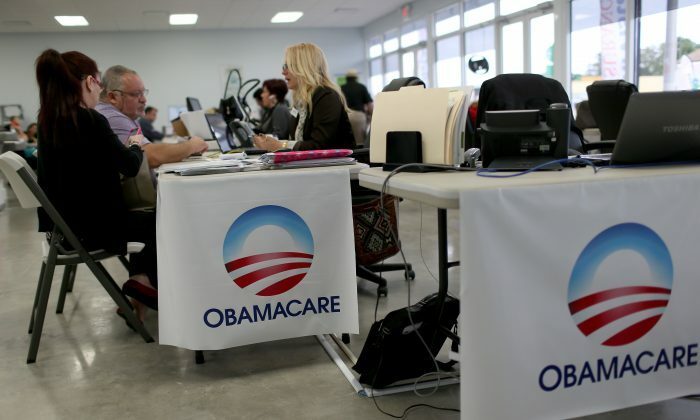 A total of 55 percent of the country will likely have two or fewer insurers to choose from. And some enrollees may need to choose another plan to continue having coverage. “Lower-than-expected enrollment, a high-cost population, and troubled risk mitigation programs have led to decreased plan participation for 2017,” stated Avalere President Dan Mendelson in a statement. Avalere’s analysis shows that seven states—Arkansas, Alabama, Kansas, North Carolina, Oklahoma, South Carolina, and Wyoming—will have only one carrier per rating region in 2017. In California and New York, for example, enrollment has been high. “Where it is working well, it’s providing insurance to those who would not be able to afford it,” said Coffman. About 72 percent of California residents who were previously uninsured in 2013 now have health insurance, according to a recent survey by the Kaiser Family Foundation. The findings show that in California, the largest source of health insurance (providing one-third of coverage) was through the state-sponsored Medi-Cal. The reason California and New York have done better may be because, unlike Arizona, the states decided to run their own exchanges instead of letting the federal exchange take over. “Letting states choose contributed to the unevenness,” Coffman said. Currently, 17 states and districts (including the District of Columbia) have their own health insurance exchanges, while 27 use the federal health insurance marketplace and seven chose a combination. Another reason California did well was due to the state’s aggressiveness in getting the word out about the ACA through marketing and by employing enrollment counselors to help people navigate the system. “A lot of places do not invest in that,” said Coffman. She added that in GOP states, Republicans at the state level “did not lift a finger” when it came to pushing out the ACA. California also has a long history with health insurance, and had more competition in the insurance market even prior to the ACA. How the problems associated with the ACA will be addressed is ultimately up to the next commander-in-chief. Hillary Clinton proposes expanding the signature program of her predecessor. “I want to build on the progress we’ve made. I’ll do more to bring down health care costs for families, ease burdens on small businesses, and make sure consumers have the choices they deserve,” Clinton said in a statement published on her website in September. Republican nominee Donald Trump says he would get rid of it. “We are going to repeal and replace Obamacare,” Trump said Aug. 18 in Charlotte, North Carolina. “Countless Americans have been forced into part-time jobs, premiums are about to jump by double-digits yet again, and just this week Aetna announced it is pulling out of the exchanges in North Carolina. We are going to replace this disaster with reforms that give you choice and freedom and control in health care–at a much lower cost,” said Trump. In Coffman’s assessment, the “rosiest scenario” for the ACA would be if there is a Democrat majority in the House and Senate. Congress is important, since many of Obama’s proposals lacked support from Republican representatives. Nonetheless, if Trump is elected, Coffman predicts Obamacare will not be completely dismantled, but it will lose major parts.